It seems that my first blog post sparked sympathy tears from several of you and, whilst I can assure you that was certainly not my intention, I am so grateful for the kind and supportive messages. I was really quite taken aback. It’s now Day 14 and I can report that my perspectives are changing and my confidence is growing and so this is the point from which I will update you today. Until this last week, my only point of comparison for my capabilities on this ride is Campbell, who is a very strong rider with the experience of being on the bikepacking road for nearly a year, and Lael Wilcox and Nicholas Carman, the couple who devised the route. Lael won the well-known Trans American Bike Race, not just in the women’s category, but overall. Additionally, a couple who rode the route two years ago have made a beautiful little film about their experience, which seems to glamorise it all slightly, focusing more on the dynamic and changing scenery and points of interest along the way. Not too much mention of the vast kilometres of rough, steep, eroded tracks which require a mixture of walking, wide-step waddling (my newly-coined manoeuvre) and a lot of swearing. Gradually, I start to realise why. The thing is with this route is that for every agonising 30km of almost unbearable torment comes the reward of the most stunning landscape or biosphere, a hidden valley with trees I never knew existed, an unexpected ranch in a lush green oasis or a friendly interaction with a local resident, expat or passer-by. OK, so time to drop the pressure and start savouring the journey. There are no records to be set. This trip is about independently reaching remote places that we have never experienced before and clearly that’s not going to come easy, nor should it. The 170km loop from Erendira over MEX1 east up from sea level to 900m to the remote Rancho el Coyote and back down to Vicente Guerrero was just what the doctor ordered. The route was even tougher than the first few days. The climbs were steep, the flats sandy and the ground was a continual variation of eroded gullies, loose rock or thick sand. But we giggled as I lost my balance when crossing the streams flowing over the tracks, plunging my trainers into the cold water, and we made up tales about the lone mountain bike track that appeared now and again on our route and wondered if we might ever meet this potential new friend (currently nicknamed ‘Bob’). After seeing only one car that day (which had got stuck in the deep stream), we chose to camp in a stunning wide-open valley half way up the climb and cook over a campfire as the mountains glowed orange and shadows grew long with the setting sun. 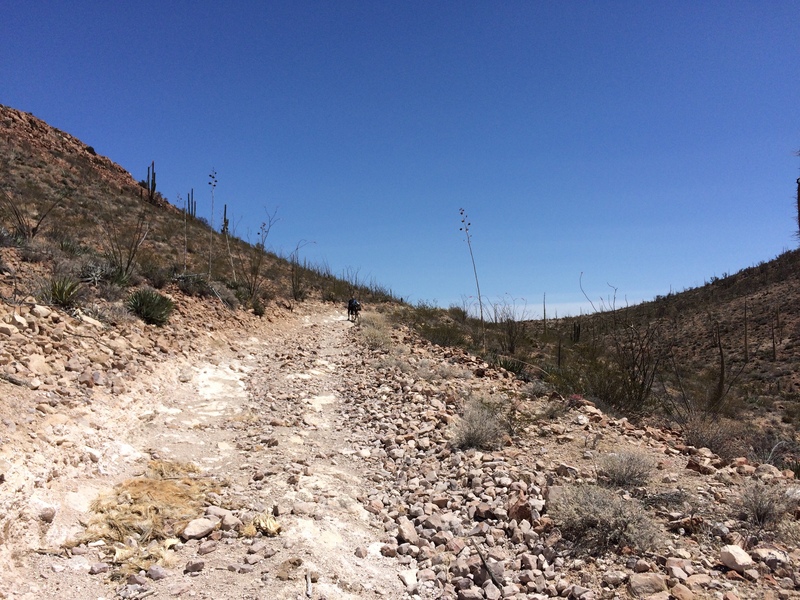 The next day after a very sweaty climb through scorched vegetation and what felt like never-ending twists and turns, we arrived to Rancho el Coyote with a small handmade poster saying ‘Bicyclers’ with an arrow pointing right. There hung a log book and a bell to sound for attention. Out popped Michael, an American expat who lives on the edge of this ranch and has done so for the last six years. Along with his four pet sheep and in front of his solar powered trailer-home he warmly welcomed us, congratulated us on making the climb and showed us how we are about the 30th to make it this year. Michael points out that not all faces arrive with a smile, like they would really rather not be there. Ok, so some people find this tough too, I thought. And I really was very happy to be there. As we entered the ranch an oasis was revealed before us. It was heavenly. 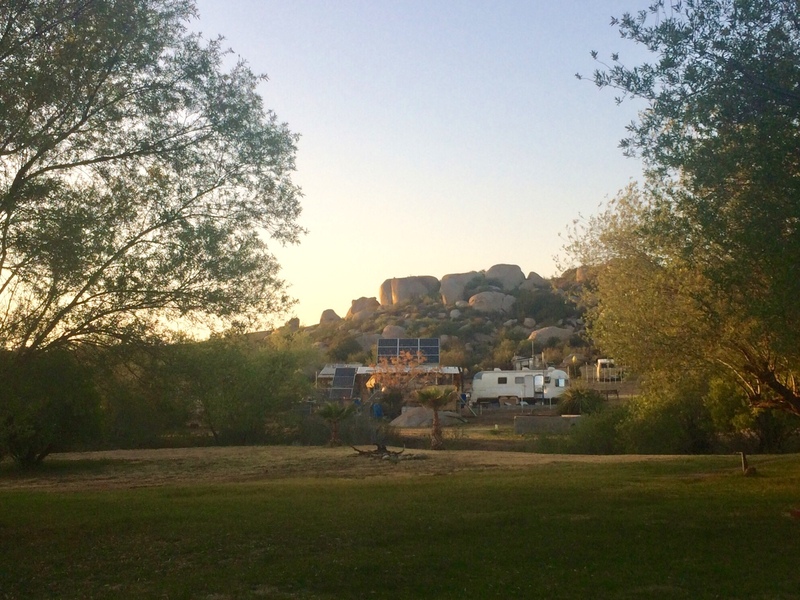 The wind powered turbine brings water up from a spring, the grass was green, the trees provide shade, the birds were singing, the views stunning and the campsite looked idyllic. This was the reward. Michael came by later that afternoon (with the pet sheep happily trotting behind), keen to exchange stories. He had such a sense of peace about him. He shared his joy of this simple life with space to think and I really do admire his, perhaps unusual, route to contentment. That was a few days ago. Since, we have descended back to sea level, then hauled back up over 700m into the mountains on a particularly difficult ascent over some 200 kilometres. 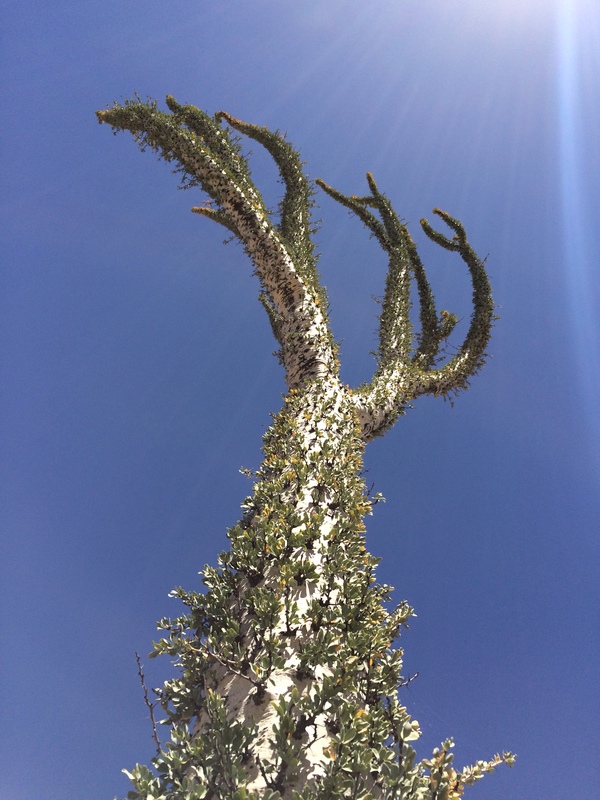 The special discovery here were the flora and fauna of the Valle de los Cirios Biosphere just over the ridge of the climb, with enormous cacti, many larger than three storey houses, and other-worldly elegant species we had never even heard of before like the Boojum Tree. We are now having a much needed rest day in Cataviña. I’m getting into the groove of this. I’m starting to love my bike – it got me through those sand flats and my handling down the short drops and kick-ups seems to be improving. The last two weeks have undoubtedly been the hardest I can remember, both physically and mentally, especially starting from a place where neither were at their optimum. 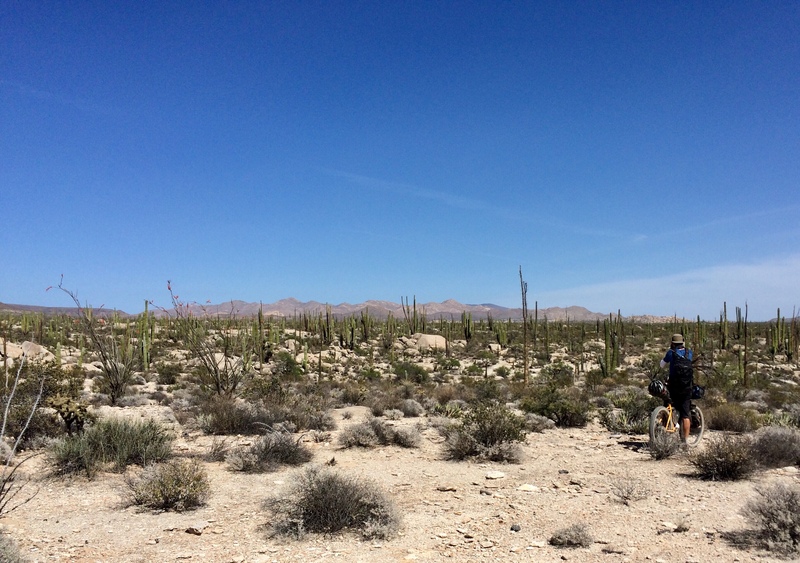 But arriving into Cataviña, with 750km and 10,000m of ascent in the bag, a third of our route in Baja, I felt really quite triumphant. I’m looking forward to getting stronger, I’m excited about stumbling across more Rancho el Coyotes and what’s more, I’ve definitely dropped the pressure. What an amazing account of your trip so far, the photos are incredible. We are very proud of your determination and grit, as well as being pretty impressed with the wonderfully descriptive prose! Love it. Keep going guys. Savour every moment! What a girl; what a heroine! You’ve survived the taskmaster’s training programme, so Hang on in there. The rewards are now clearly starting to arrive. How very satisfying.. Thanks Colin, things are certainly getting brighter and much more rewarding! Brilliant blog Sarah. Sorry it has taken me a few days since your message to get to read this. You write so well and the photos are amazing. What an amazing experience. Lovely, and glad to hear you’re getting into the swing of that ‘living the journey not a route’ philosophy that impressed me on your leaving drinks .